ODMP – A development programme of the Federal Republic of Germany through KfW, Govt. of India, Govt. of Odisha and German Red Cross. Implemented by Indian Red Cross Society, Odisha State Branch. To provide safe multipurpose cyclone shelters for the most vulnerable. 59 Multipurpose Cyclone Shelters have been constructed in two phases, i.e. With the support of the Federal Republic of Germany through the German Development Bank (KfW), German Red Cross (GRC), Govt. of India and Govt. of Odisha. Area of operation – Most vulnerable coastal districts of Odisha i.eBalasore, Bhadrak, Kendrapara, Jagatsinghpur, Puri&Ganjam. For major maintenance and repair of ODMP Multipurpose Cyclone Shelters, IRCS – OSB has set up a ‘Maintenance Corpus Fund’ (MCF) with majority of contributions from KreditanstaltfürWiederaufbau (KfW) and Government of Odisha (GoO). KfW on behalf of Indian Red Cross Society – Odisha State Branch has retained M/s Deloitte Touché Tohmatsu India Private Limited (DTTIPL) to formulate the statutes governing the Maintenance Corpus Fund (MCF) which covering MCF Governance Mechanism, Establishment Guidelines and Operations Mechanism. 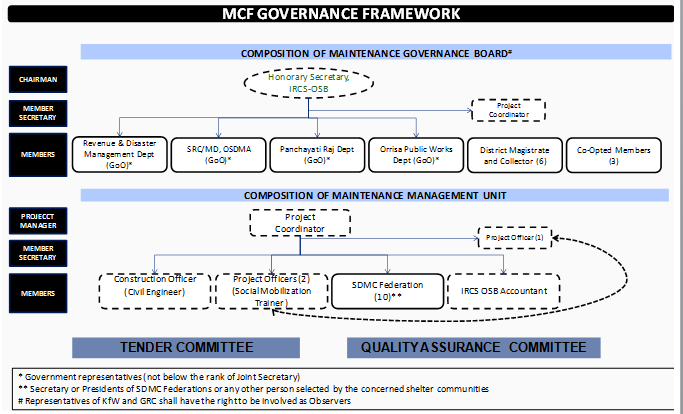 Maintenance Governance Board (MGB), responsible for overall administration and monitoring of the MCF. Maintenance Management Unit (MMU), responsible for actual implementation of all activities related to shelter maintenance and social mobilization. In addition, a Tender Committee and an Quality Assurance Committee is constituted to ensure independence of tendering process and effectiveness of the maintenance work. Provide leadership and overall governance of MCF including approval of budget for shelter maintenance and social mobilization. Ensure effective and timely maintenance of 59 Multipurpose Cyclone shelters. Review and monitor the activities performed as a part of MCF functioning. Co-ordinate and agreements with various stakeholders in pursuit of the objectives of MGB. Inclusion / exclusion of members to/ from the Governance structure (except the observer). Ensure proper accounting and auditing of MCF records. Supporting MGB in effective execution of the functions assigned to the MGB under this statutes. Planning and preparing the annual budgets and operating plans for utilisation of MCF. Ensure appropriate monitoring, evaluation and assessment of activities carried out of MCF. Ensure synergy/ convergence across all units of MCF Governance Structure. Ensure proper accounting, auditing, reporting and statutory compliance. Perform risk assessment and review the adequacy of internal control, internal audit.